NASA released the first video of Earth spinning for an entire year thanks to the only deep space satellite, Deep Space Climate Observatory. Images of our world as seen from outer space help put our problems — our very existence, really — into perspective. In its nearly 60-year history, NASA has often worked to share that very experience with those of us who can’t take off in rockets. With that mission in mind, NASA’s Goddard Institute for Space Studies released a time-lapse video of our planet like you’ve never seen it before: rotating through one full year, as seen from a million miles away. 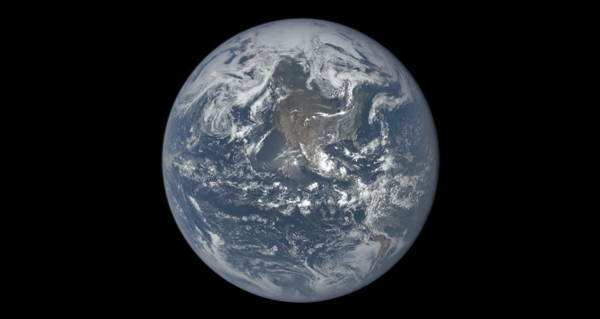 The video is composed of thousands of photographs taken by the Earth Polychromatic Imaging Camera (EPIC) aboard the Deep Space Climate Observatory (DSCOVR), the first deep-space satellite dedicated to photographing our planet. The photos in question are so well-lit because of the probe’s perfect positioning in a unique piece of space real estate called Lagrange point 1. “This orbit is a gravity neutral point in space, allowing DSCOVR to essentially hover between the sun and Earth at all times, maintaining a constant view of the sun and sun-lit side of Earth,” the National Oceanic and Atmospheric Administration, which operates DSCOVR, explains. The probe, which was first proposed by then-Vice President Al Gore, helps scientists monitor weather and climate changes. Next, read about how NASA will create a homemade Aurora light to show in America’s skies. Then, check out these amazing 26 photos of NASA landings throughout the decades. 22 Fascinating Facts About Nikola Tesla, History's Greatest "Mad Scientist"